Frugal cruising... means not wasting money, so that the money you do save will enable you to do the things you enjoy...our favorite way of spending our travel dollars is on cruise ships. We are frugal on land so our discretionary dollars can be spent on cruising...to us there is nothing better than being waited on 24 hours a day. Unpacking once and never worry about cleaning the room. I would never spend money to a see a show, when the on board entertainment on a cruise is so good. I never worry about drinking and driving...if you can operate an elevator, you can find your cabin. You essentially are on a floating 5 star hotel that does all the driving between wonderful destinations. Do we have a favorite cruise line yes Celebrity...we used to use another line, we have taken about 35 cruises in total...go to the previous link and see why we choose what we do now. It all starts with doing your research online. But remember "the internet is for looking...a travel agent is for booking"
And do we have a superb agent, when you book always call Paula at 702-478-7480...a top producer, always available with great contacts at the cruise lines...since she sends them a ton of business, they take care of her clients. Tell her I sent you...you can thank me later. You would be surprised at the varying prices people pay for the same cruise... I know I have caused some long faces between spouses at the ship dining room when the discussion of what was paid for the cruise, comes up, . I have learned not to be specific...Julie and I can chuckle in private. Using Paula exclusively I do not worry about overpaying...she does not cost me a dime...and has saved me lots of money. You do know I am frugal/cheap...right? You might think you can save by going direct to the cruise line...you cannot...it is worth it for the cruise lines to not have to answer questions, like... will I get sick? (answer no), what shall I wear? (answer, what ever nice and is comfortable...dining, what you would normally wear to a restaurant), what if, what if...you get the picture. If you are a beginner, I would go with this site, for low-cost cruises, or just go to Google and enter cheap cruises in the search box... There are other sites as well. Just remember what I say about booking. Frugal cruising is always choosing an inside cabin... These are the cheapest because they do not have an outside view. We have discovered dozens of hideaways with great views that are free to everyone. When you book do not book a specific cabin, just the lowest price, this will give you the opportunity, not a guarantee, to be upgraded to the next cabin level for free. There really is no downside, if you end up in an inside cabin you will find the darkness great for naps. There are always common areas, as well as outside, that you can visit for a view, read a book, etc. Plus you eat the same food, see the same shows as your fellow travelers, that have paid much more than the inside rate. Shore excursions sold by the cruise lines are almost always more expensive than doing it yourself. Some folks will worry about missing the boat if they get a taxi or rent a car and head out on their own... I've never seen anyone left yet waving frantically as the ship pulls out. You almost certainly find yourself bombarded at the dock by people selling shore excursions, at almost any port, and they are always much cheaper than buying a tour on board. Another huge advantage of doing your own shore excursions is the weather, if you booked a shore excursion, and it's pouring rain... Too bad, you are stuck. Do-it-yourself, when you arrive , you can make the weather call. You can also split the cost of a rental car with someone that you meet on the boat... Be careful here, it's more trouble than it's worth, if the other folks want to shop when you want to see the sights, or vice versa, choose your companions carefully. Caveat...this applies only to the US...I would be very hesitant to rent a car abroad...it's up to you. A great resource for what to do in each port is Toms Port Guides... A free resource that gives tons of information about each port that you may visit. 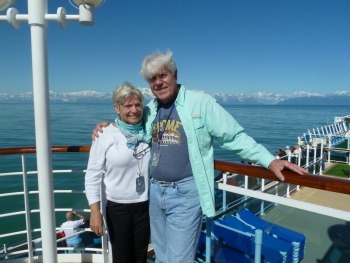 I had the pleasure of meeting Tom and his wife on our recent transatlantic cruise and I would recommend his site highly for anyone taking a cruise. Getting on a cruise ship may or may not be your idea of fun... It sure works for us and I hope it will for you as well. Saving our pennies while we're on land to spend them at sea is why we employ frugal living techniques. We enjoy the fine dining, and the attentive service, three times a day on a cruise ship...OK, two times a day when you're in port...here is our number one tip for saving money. See how that ties in with dining on a cruise ship?